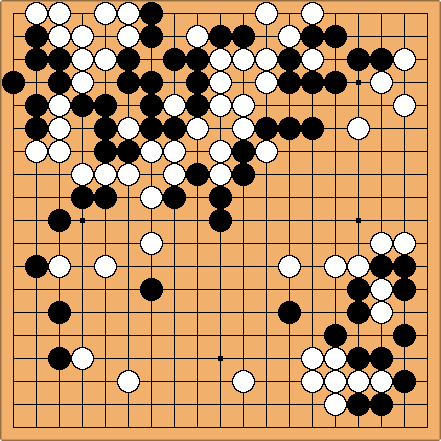 Black's left side looks thin and White is tempted to invade there. The big white dragon is still eyeless, and White is always aware of the fact. The way White tried to find the solution does not seem the best. It is difficult to find the best plan for White, though. White 1 is a very bad move. White knows exactly that the result will be a very small life on the side while allowing the opponent to connect above and continue to attack White's dragon. The next diagram shows an alternative which is better. The territory White gives Black is on the second and the third line while White gets nice thick outward influence. Moreover, a move at a in future threatens to cut and capture two stones and thus almost gives gives an eye to the white big dragon. Black 2, 4, 6 is standard technique to connect the groups by sacrificing a stone and giving the opponent only a small life. White replies with 3 and 5. White 7 is a bad move. Usually it this capture is fine: White gets the second eye on every side easily. But White has to consider also the possibility to push from either side first. After 3, getting life with sagari a threatens to connect to the dragon. 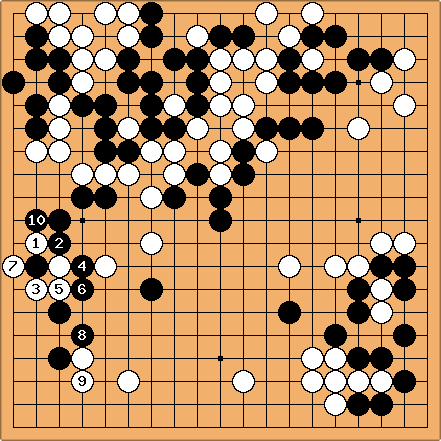 Black 8 protects against a cut and puts some pressure on the white hoshi stone at the same time. White 9 is reckless since the dragon is now under pressure. White had to connect to the dragon, playing at the point above 10. The corner is not that big a loss if White lives and can protect the territory at the bottom. White faces a hard fight if Black splits the bottom instead but then she has some chance to save her groups separately. The move in the game does not protect the bottom, and does not help the dragon. Black 10 forces white to make two eyes and cuts this small group off from the dragon.